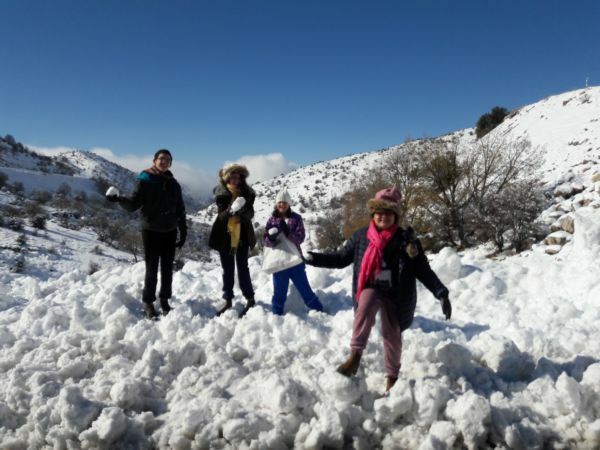 Our Eilat grandchildren, joined by one of our Sde Boqer ones, enjoyed a visit to the Hermon with Granny Doreen to enjoy the snow. More pictures here. During the last week we have celebrated Chanuka, the Festival of Lights. We took part in some of the nightly lighting of candles (1 to 8 depending on the day) and the singing of Chanuka songs. Click for some pictures. Our three Eilat grandchildren, Itamar, Amit and Ilai and granddaughter Lotem Segoli joined us for three days during the Chanuka vacation. Doreen prepared a program for them, a visit to the Florentie Circus, a trip to the Hermon to see the snow (see picture above), and the new Harry Potter spin-off movie "Fatastic Beast". More pictures here. Last week I wrote about the delicious vegan sufganiyot (doughnuts) that Vered has prepared for us. See the recipe on our Family Recipe page. And while you're there check out the special potato zucchini latkes recipe. It seems like the latest craze is costume pyjamas. See Limor, Amit and Ilai Levy showing off their pyjamas. Ilai Levy's class went on a school trip to Coral World and Ilai proudly showed her classmates a baby crocodile. Next week we will be in Sde Boqer to celebrate Maayan Segoli's barmitzvah. He has been preparing for it - click for a picture. If you haven't managed to see Doreen's account of our Portugal trip you can access it here. And a happy, succesful, healthy and wonderful 2017 to all our relatives and friends. 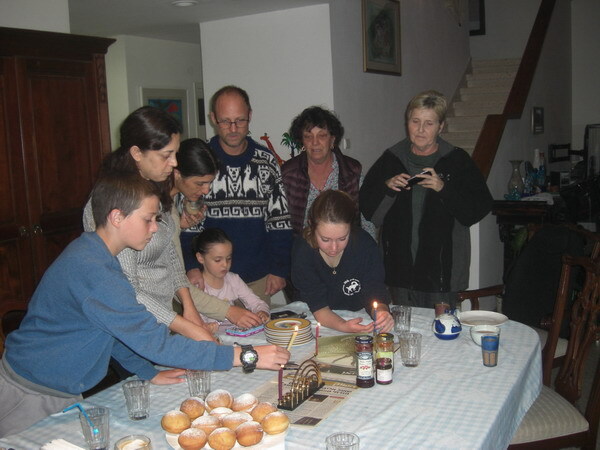 Daughter Vered invited us to join her family together with Moran’s family to light the first Channukah candle. Since both her daughters are vegan the thought that Vered would be preparing vegan doughnuts - sufganiyot - was not appealing. How wrong we were. The sufganiyot were light and tasty. Doreen has the recipe and it will appear next week on this site in "Family Recipes". Two days ago we returned from a most enjoyable trip to Portugal. Part of the time we stayed with bridge friends Connie Goldberg and Rui Marques and toured the Lisbon area and environs. We also spent some days in North Portugal visiting interesting towns and places. All in all it was a great trip, and Doreen has written about it. Read what she wrote, with pictures, by clicking here. Grandson Maayan Segoli is becoming quite versatile in his cooking, and prepared a delicious tiramisu. See pictures. We were happy to have second cousin Susan Nathan (see Levy/Hershovitz family tree) as a guest this weekend. Although she lives in Israel we have not seen each other for many many years and it was very pleasant catching up on family matters. Click for a picture of Susan and Doreen at Caesaria. We wish all our relatives and friends a very happy, successful and healthy 2017. In the meantime, enjoy the Channukah/Christmas/other festivities. We are in Portugal and yesterday was our 52nd Anniversary. 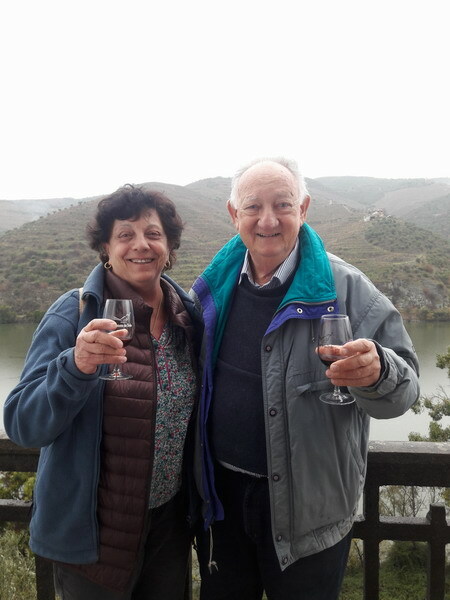 We celebrated by driving along the Douro Port Wine Route, with a stop at the winery Quinta do Tedo on the bank of the Douro River to taste their delicious Port wine and lift a toast to 52 years of friendship and love. We have been a week holidaying in Portugal and enjoying every day. We spent the first few days in Caiscais near Lisbon visiting the sites in the area and enjoying the hospitality of friends Rui Marques and Connie Goldberg. We're in the north, near Porto at the moment, and return to Israel in 4 days. 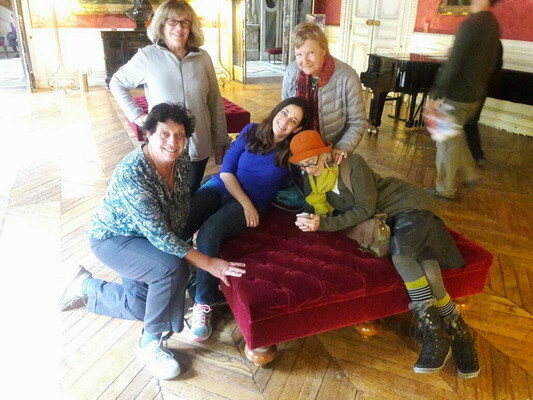 Pictures and comments on our trip by Doreen will hopefully be in next week's update. Granddaughter Dani Ron is in Prague enjoying her visit with some friends, and exeriencing the Christmas atmosphere there. See picture. Doreen and I spent a lovely morning reconnecting with second cousins Sydney Lossin and Beverley Taylor. 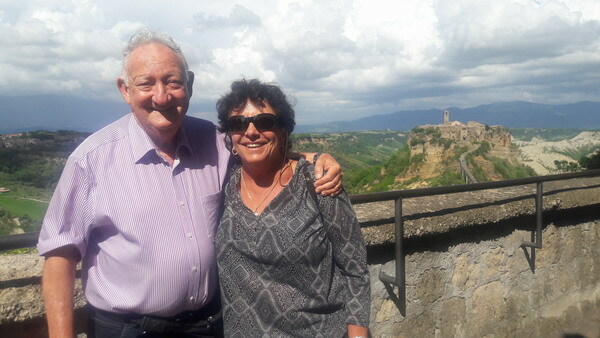 Sydney and her husband Ari live in Asseret and although we have fairly regular email contact we have not met for about 20 years, even though we have lived in Israel for over 50 years. Beverley lives in London and this was the first time we have met. See Matz family tree. Granddaughter Danielle is back from her trip to Amsterdam and getting ready for a nice long "post-army" trip. 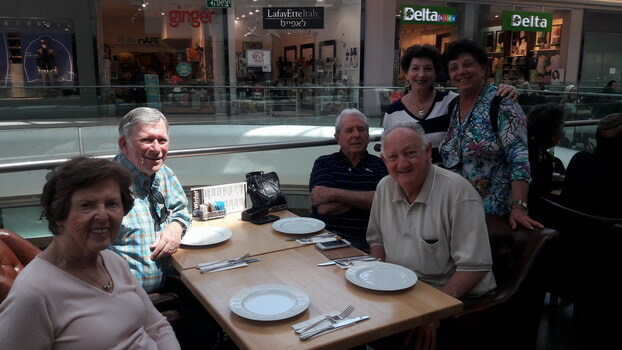 Doreen joined sister Louise Braverman on a visit to Sarona with Louise's school friend from Barnato High School in Johannesburg, Anita Etzman. (see picture). Tomorrow we fly to Portugal for a holiday. This is the first time we will have visited Portugal and we are both looking forward to it. We will stay some of the time with bridge friends Rui and Connie and also, of course, do some touring. Old Photos series: In June 1990 we went on a jeep tour of Egyptian Sinai, together with friends. It was an quite an eventful tour; a jeeps tour. During the 5 days of the tour we had to change vehicles 16 times, using 8 different vehicles - inluding one that was confiscated off the road with us in it. It didn't have a valid license. On one of the nights we arrived in darkness at our sleeping point. When we woke up in the morning, in the middle of the Sinai desert - our guide and jeep were nowhere to be seen. But we were next to an incredible mountain painted in vivid blue, We explored "Blue Mountain" as we explored the possibility that we had been abandoned and had no idea where we were. Our guide did eventually reappear with a 'new' jeep. A Belgian artist, Jean Verame, had painted some rock formations blue to commemorate the peace agreement between Egypt and Israel. On another day we dehydrated in the hot summer sun, together with our jeep that overheated and it seems it needed more water than us! Altogether a most memorable trip. 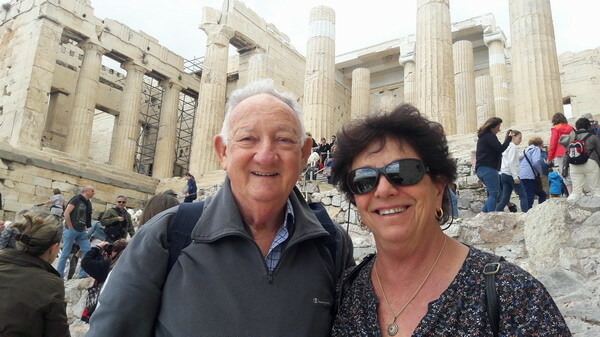 Colin and Louise Kessel were on the trip with us and sent us the itinerary and vehicle changes. Granddaughter Danielle has gone for a short "post-army" trip to Amsterdam. Daughter Vered Ron and husband Aviv are in Paris for a few days. 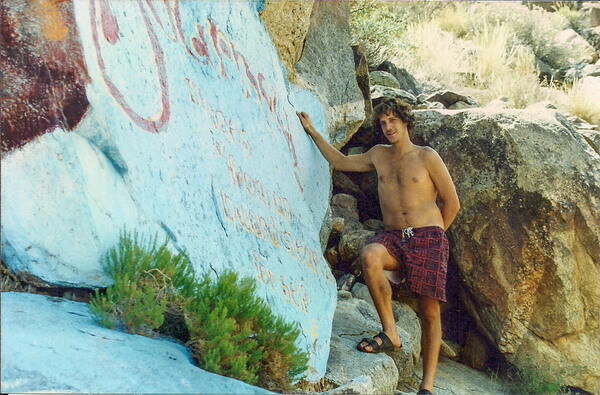 Another in the Old Photos series: In 1995 Doreen and I went on a long RV (motorhome) trip in Western USA -Utah, Colorado, South Dakota, Idaho, Wyoming, We visited many of the canyons and parks the West is famous for, and also met family. 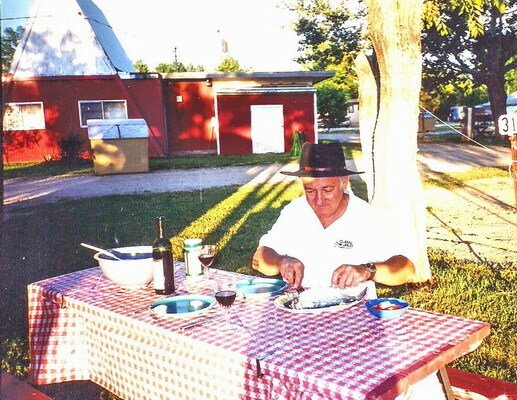 We lived and ate in the motorhome and parked in campgrounds. We hiked, climbed, rode bicycles, and fished. In Wyoming I was lucky to catch a reasonably sized trout in the Wind River and I'm sure Doreen and I enjoyed the meal. Click for other pictures of our 1995 RV trip. Granddaughter Lior Ron is back from a school educational trip to Poland. This past week Israel has experienced large forest fires with much damage to property and nature. Apparently many or most of the fires were deliberate and politically motivated. Read Doreen's column on these 'terrorist fires'. Grandaughter Danielle Ron finished her compulsory army duty this week after two years in service. 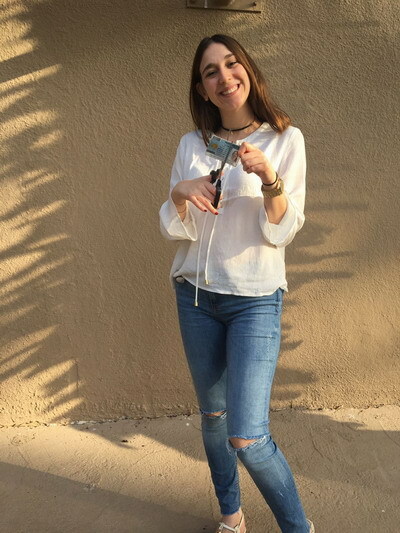 She marked her first day as a civilian by cutting her army ID and wearing her favourite jeans. Click for her last picture wearing uniform. Grandson Itamar is recovering from his operation and will be back at school this coming week. The procedure went smoothly and everything was successful. After two week's rest he was back to normal. Click here for a picture. We spent the last 4 days in Eilat where I was a Tournament Director at the Red Sea Bridge Festival. It is always enjoyable - a mixture of family, work and meeting old friends both from Israel and overseas. This year we spent a couple of nights in a hotel near the Festival venue and enjoyed the rest and the view. While we were in Eilat granddaughter Amit Levy celebrated her 11th birthday. Click for pictures. Son Aviv Levy spent the last week sailing from Greece to Herzliya, Israel, helping to crew the yacht Jacquelina. He arrived back in Eilat in time to help us finish our steaks at the El Gaucho restaurant. Granddaughter Lior Ron is on a school educational trip to Poland. While I was in Zagreb (see below) Doreen took the opportunity of flying to Paris with three friends. Our daughter Vered joined her for part of the time. Doreen is still there and reports that she is having a wonderful time. Click for 2 more pictures. Grandson Itamar needed an operation last week. The procedure went smoothly and everything was successful. After a week's rest he was back to normal. Click here for a picture. I am writing this from Zagreb in Croatia, where I am officiating at the European Bridge Champions' Cup and participating in a meeting of the Executive Committee of the European Bridge League. 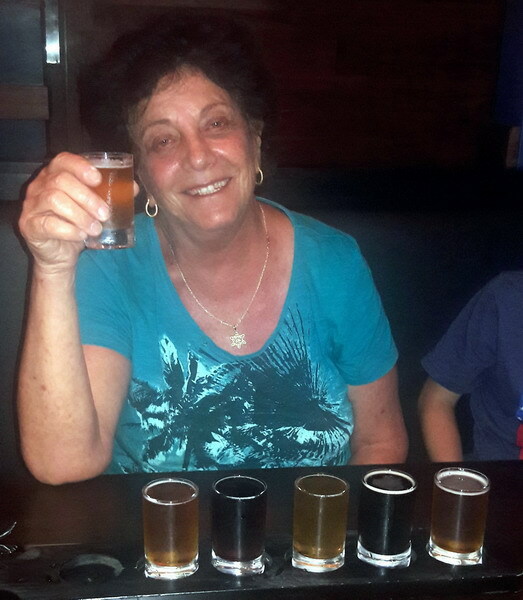 Both Doreen and I will be arriving home this coming Monday, in time for a 4 day trip starting Wednesday to Eilat for the Red Sea Bridge Festival..
Congratulations to Yaffa Loew (nee Bortenstein, see Schank family tree) on her 70th birthday. 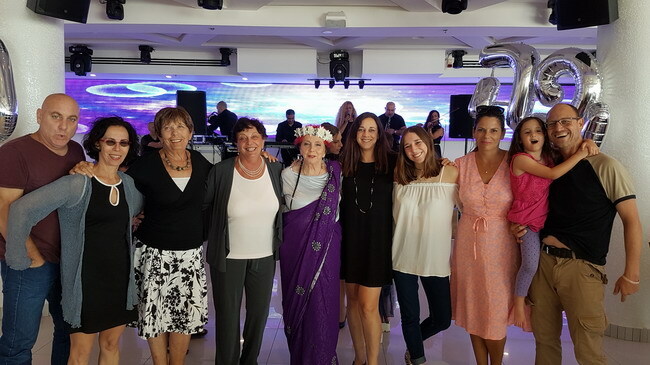 Relatives and friends met to celebrate a special person at a great party organized by her daughter Vered Shavit. 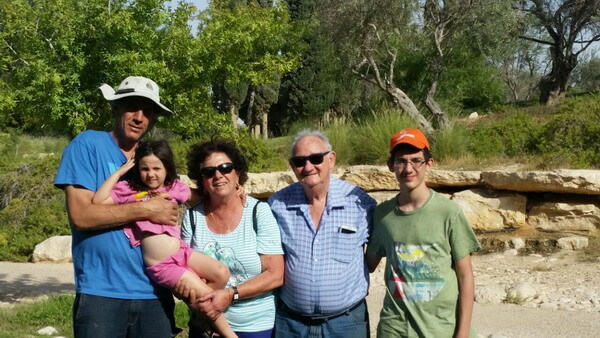 Granddaughter Lior had visited Yad VaShem Holocaust Memorial with her class in preparation for their journey to Poland later this month, but expressed a wish to visit again.This week Doreen took her there for a personal and deeper insight. By chance, her sister Danielle was visiting there with her base on the same day. They were happy to meet up at the entrance. See picture. Doreen will be overseas for 6 days next week, visiting Paris with 3 friends, Daughter Vered, on a business trip, will join them for a few days. Enjoy! I will also be overseas next week, in Zagreb, Croatia, for 5 days, officiating at the Bridge European Champions' Cup and at meetings of the European Executive Committee. Because of my visit, next weeks update of this site will probably be next Sunday, not Saturday. Moran has updated the Segoli site with lovely pictures from their USA trip in the summer - in Hebrew and in English. Lotem Segoli is 11 ! 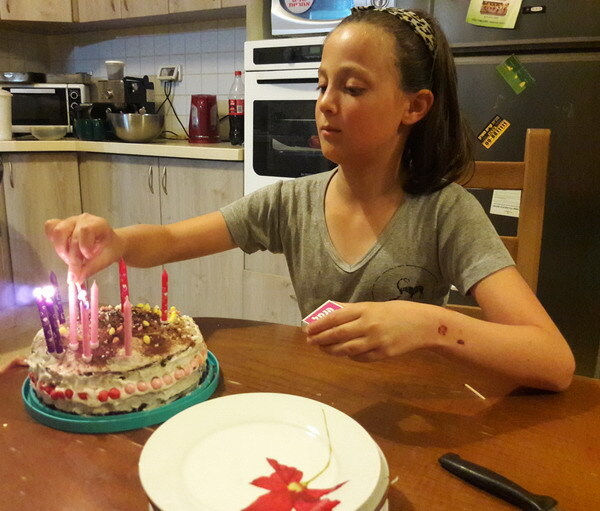 This weekend we went to Sde Boqer to celebrate granddaughter Lotem's 11th birthday. We didn't have a party but Doreen baked a cake which Zoe decorated (see picture). Click for another picture. Happy birthday, Lotem! The Eilat Levys were going to come to Sde Boqer for Lotem's birthday, but there were exceptionally heavy thunderstorms and rains in Eilat and all the roads - as well as the airport - were flooded and closed to traffic. Aviv sent us some pictures. Last week was the festival of Sukkot - Tabernacles - and the Aviv Levys set up a traditional sukkah (hut) where they ate their meals. See picture. 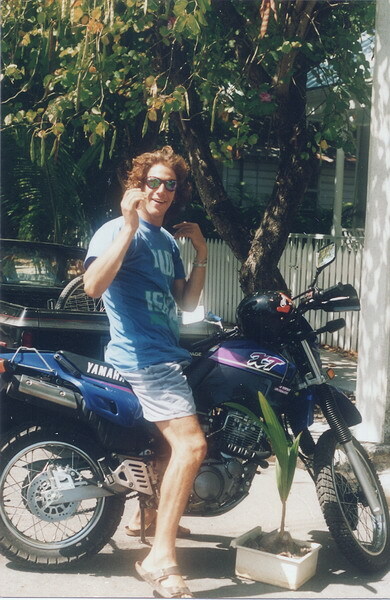 This Week's Picture is of son Aviv on his motor bike in Key West, Florida, where he successfully attained his associate degree in Marine Biology in 1996. Aviv has decided to resume his studies and has registered for a degree at the Eilat campus of Ben Gurion University. The whole family wish you the best of luck, Aviv. This is another pre-digital old photo. Click here for other old photos. Doreen left early this morning guiding a 10 day tour of tourists from South Africa. We spent a couple of days in Eilat this week and once again enjoyed a visit to Coral World, where Doreen was fascinated by the rays. In addition to our garden at home, we continue to enjoy our municipal allotment of a small vegetable plot. We have eaten corn, peppers, beans, Chinese cabbage and tomatoes grown there by us. The allotment is also a social activity area where neighbours, especially those with young children, get together. See pictures. We celebrated Rosh Hashanahת the Jewish New Year with all 16 family members at the Segoli residence at Midreshet Sde Boqer. There was plenty of food and and as usual we all enjoyed each others company. There are some more pictures, and links to pictures, here. Back in Eilat granddaughter Amit Levy took part in a traditional tashlich ceremony, where all sins are symbolically cast into running water, in this case the Red Sea. Click for 2 lovely pictures of lovely Amit. At Sde Boqer we saw that granddaughter Zoe Segoli has finally learned to ride a bicycle all by herself! We also had an opportunity to see another example of Lotem's theatre make-up skills. A last look at Times Square before our return home after our American vacation. We're back home after our 3 week + trip to the USA and Canada. It was a great vacation especially as we were able to renew friendships with family and friends. On our last day in New York we went on a walking tour of the area around Grand Central Station. It was most instructive and it gave depth and meaning to all the buildings we had seen so many times without appreciating their history and architecture. "StreetWise New York" has various tours on every day of the week, and we highly recommend a tour. Their address is www.streetwiseNewYork.com. 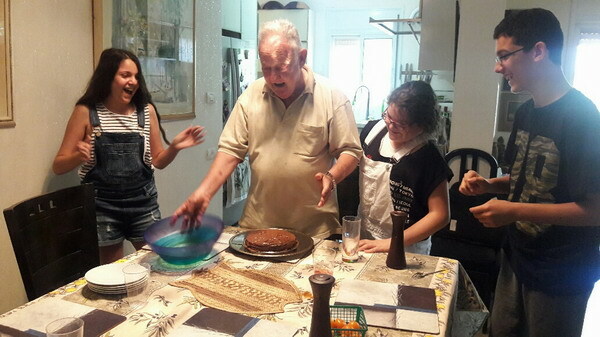 Back in Israel, we were in time to celebrate the 21st birthday of our eldest granddaughter, Danielle. We met at Vong, a Tel Aviv Vietnamese restaurant where we had tasty dishes - vegan for Danielle and sister Lior, and "normal" for the rest of us. Click for picture. Rosh Hashana, the Jewish New Year starts tomorrow evening and we wish all our family and friends a Happy New Year - SHANA TOVA שנה טובה . May your lives be filled with happiness and fulfilment and may Israel (and the world) make progress towards the peace we all need and want. We will celebrate the New Year at Midreshet Sde Boqer with all our children and grandchildren - a grand family reunion. What does one do when one has to choose which beer to drink at a restaurant with its own brewery? Doreen found the answer! We're still in the USA approaching the end of our trip which has been most enjoyable and successful. We are now in Philadelphia again with Nina, and later we leave for New York where we will be for 2 days before returning to Israel. In Philadephia we visited and stayed with close friend Nina Schafer. Then we were hosted near Elkton in Maryland by Frankie Klaff (see Goldberg family tree) and Dave Rothschild who also lent us their car. (For a couple of pictures of previous visits to the Schafers and Klaffs, click here.). We drove to Washington, stayed with Nina's son Zach, and visited some historic sites, as well as the Holocaust Museum. From there we drove to Leesburg and stayed with Frankie's son Tamir and lovely family. Then back to Frankie and Dave via Baltimore with a visit to the fascinating American Visionary Art Museum. See pictures here. It has been a great vacation and we so enjoyed staying with the Glogauers, the Greeenbergs, the Myers, the Schafers Nina and Zach, and the Klaffs Frankie/Dave and Tamir family.Thank you all for putting us up at your super friendly "B&Bs". On our visit to Toronto three of their sons and families came over for dinner. We have seldom felt so welcome, embraced by their loving family. Two days of non-stop talking wasn't enough to catch up on years of family doings. We spent a lovely day with them at the Niagara Falls. Click here for pictures. We have arrived in Philadelphia after spending last week in Canada and Mineapolis. We will be here for a couple of days with Nina Schafer and then spend some time with Frankie Klaff and Dave Rothschild. We renewed relationships with family and friends, some of whom we haven't seen in decades. 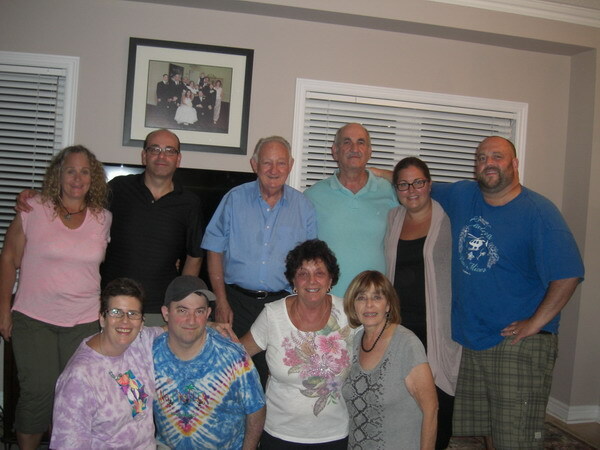 We met the Glogauers (see This Week's Picture above), Aura and Hilton Greenberg, John and Ethne Nussbaum, Mervyn and Terry Kaplan and Roy and Gillian Myers. Read more and see pictures here. The Ruins of Fire Engine "Ladder 3"
We have just visited New York on our trip to USA and Canada. The highlight of our New York visit was the Memorial and Mueum dedicated to the terror attack on the Twin Towers 9/11 2001. We visited 2 days before the 15th Anniversary, and it brought back many memories. From the top of a hill overlooking central New York we saw the second Tower fall, and spent some anxious hours worrying about our son-in-law Aviv who was in an airplane while the attacks were taking place until we heard that his plane had been ordered to land and that he was safe. 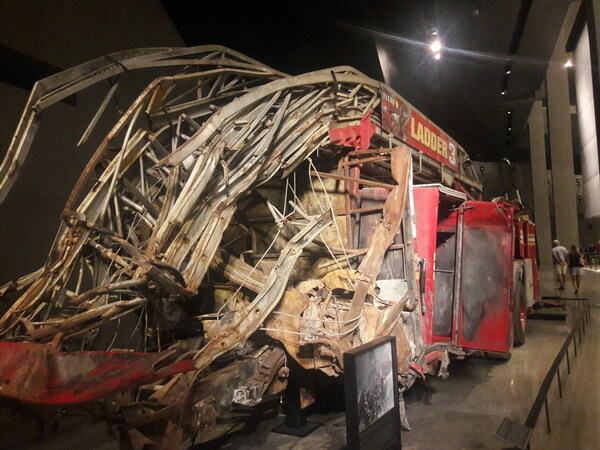 I was especial moved by the stories about the emergency responders, police and firefighters, who went to the site of the attack - 414 died, including all 11 of the firemen who were in Ladder 3, the remains of which are pictured above. We have just finished our trip to New York, and are about to leave to continue our trip in Canada. Click here for pictures of some of our experiences in New York. Children: "Bye Grandpa! Bye Granny!" Grandpa: "At last!. We've got vacation until Rosh Hashanah (New Year) eve." Granny: "Just pray that there won't be a (school) strike before then...."
Having just finished a few rounds and a few weeks of babysitting (see last 3-4 items of Archives) we found this cartoon most amusing. We finished this "semester" of babysitting with 2 days in Midreshet Sde Boqer looking after the Segoli grandchildren. We came with Flopsy (who has a love affair with Zoe) and Twitter to help us, and left with Flopsy only. The Segolis will babysit Twitter for the next 3 weeks or so. School holidays are over, the grandchildren are back to school, and we are on our way to USA and Canada for a 3 week vacation. Congratulations to eldest grandchild Danielle on receiving another stripe on her shoulder. Well done, Sergeant Danielle. Congratulations also to granddaughter Amit Levy who started the school year on the right foot by doing safety patrol at the road crossing to her school. 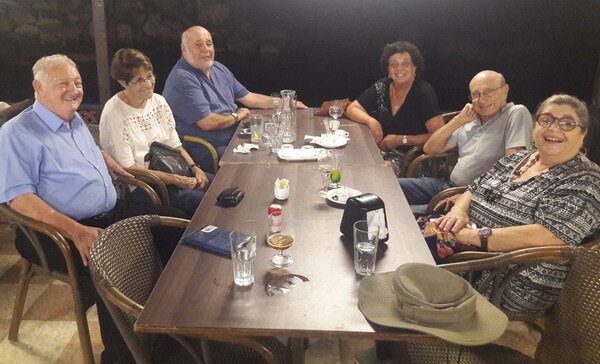 This week we enjoyed a delightful evening in the old city of Acco (Acre) with old friends Jimmy and Tamara Rabinowitz (see Glezer/Gordon family tree) and Mike and Frankie Jaffe. I haven't seen Mike since he diagnosed me with measles about 60 years at an Habonim youth movement camp. I've met Frankie sporadically over the years and it was lovely seeing her again. And it is always a pleasure to be with Jimmy and Tamara. As reported last week, last Friday night we all enjoyed Doreen's delicious roast duck . Read her recipe here. Our Segoli grandchildren spent their last few days with at the beginning of the week. Doreen took them to the Sky Jump Trampoline Centre . Pictures here and here. A little belatedly Doreen celebrated her birthday with some friends with a breakfast. See picture. 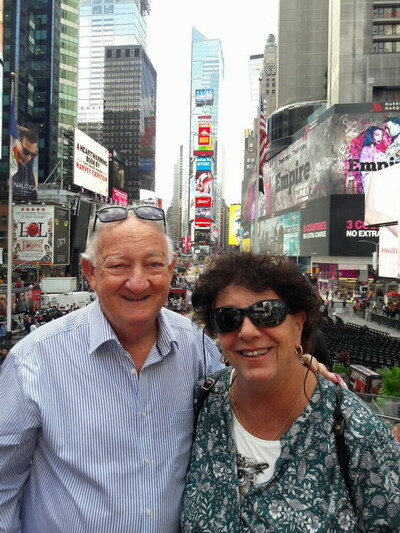 This coming Saturday Doreen and I will fly to the USA and Canada for a three week visit to visit friends and relatives. If you missed it last week you can access the updated Segoli site with pictures of their Galapagos visit. Click for Hebrew or English. Last week the Segolis returned from their trip to the Galapagos and USA. 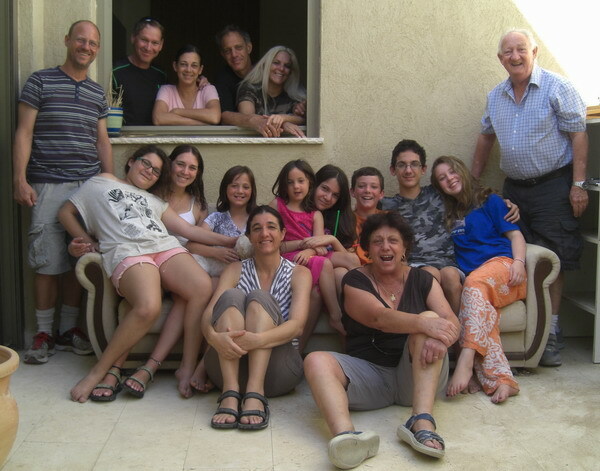 They spent a few days with grandparents Yael and Avram Segoli, then a few days days with us, to give parents Moran and Mikhal time to get organised. On Friday night Moran and Micha and daughter Vered joined us for a delicious roast duck meal prepared by Granny Doreen. The Eilat Levys spent a few day with us. Among other things, Doreen took Itamar, Amit and Ilai to the National Museum of Science in Haifa, and aunt Vered took them trampolining. Then by train to Beer Sheva where Abba was waiting to take them back home to Eilat. The Shanghai Circus is performing in Netanya, 200 meters from our apartment; and of course first the Levys then the Segolis enjoyed the show. It's an rexcellent circus, and I warmly recommend seeing it. The Segoli site has been updated with pictures of their Galapagos visit. Click for Hebrew or English. On Thursday the Segolis returned from their trip to the Galapagos and USA West coast. (see some pictures of their trip here). Mikhal's mother Yael, and Doreen and I were at the airport to meet them and hear the highlights of their trip over some coffee and cocoa at the airport. The children will be spending a few days at Yael's home while the parents organise their work schedules. The Eilat Levy children, Itamar, Amit and Ilai, are with us for a few days. They arrived on Thursday from Eilat and and after picking them up at the airport we went straight to the home of Yael and Avram Segoli in Mevasseret to spend some time with the returning cousins (see above). Louise Braverman, Doreen's sister, celebrated her birthday yesterday, and I organised a 3 table bridge competition for her and some friends. Everyone had an enjoyable time. Granddaughters Danielle and Lior Ron have gone on a 4 day vacation to the Greek island of Kos. Looking at this picture taken at the airport they're going to have a fabulous time. Their parents Vered and Aviv drove to Tiberias after dropping them off at the airport to spend a weekend at the Scot's Hotel. 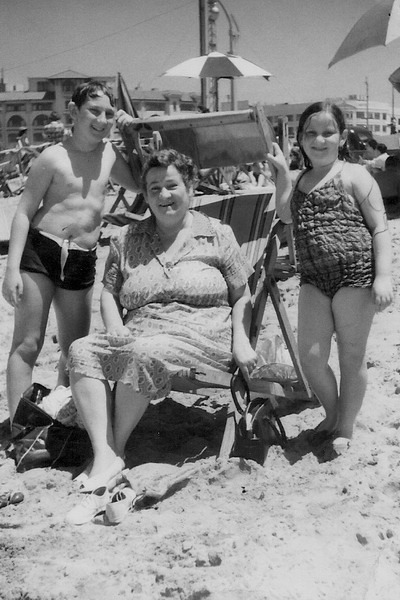 The yahrzeits (anniversaries of death) of my mother, Queenie (56th), and my sister, Fern (8th), occur at this time of the year, so I thought it fitting to use this old photo as This Week's Picture. Click to link to Fern's Memorial page. 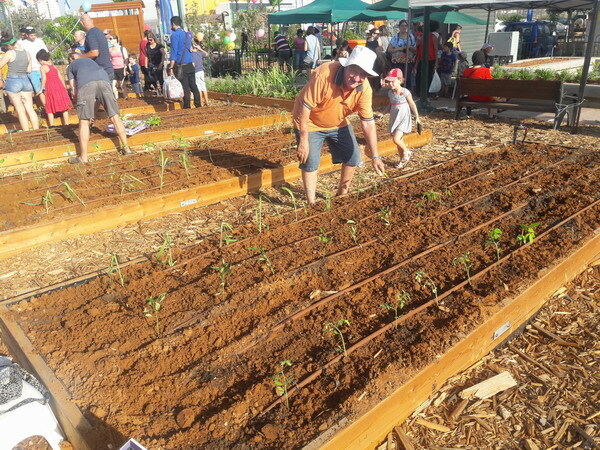 The Netanya Municipality has just made 100 small plots or patches available to residents for planting vegetables. We registered for a plot and on opening day the area was filled with mainly families planting seedlings supplied by the municipality. Later we will plant our own seeds. The watering is done automatically so that's one thing we don't have to worry about when we're away. This is a nice addition to our fruit trees, peppers and vegetable patch at home. I regret to announce that Joe Woolwich, a second cousin, passed away on 13 June in Manchester, England. He had not been well for some time. Joe was a frequent visitor to Israel and we saw him fairly often. See picture. Granddaughter Dani has again had her hair cut and donated for wigs for needy cancer sufferers. See pictures. The Segolis are still in California. Mikhal is working in Davis, and Moran and the children are doing some touring with long-time friend Ron Kagan. Doreen writes: "We have all attended concerts that were wonderful, inspiring or delightful; not often does one have the privilege of attending a concert that moves people to tears. 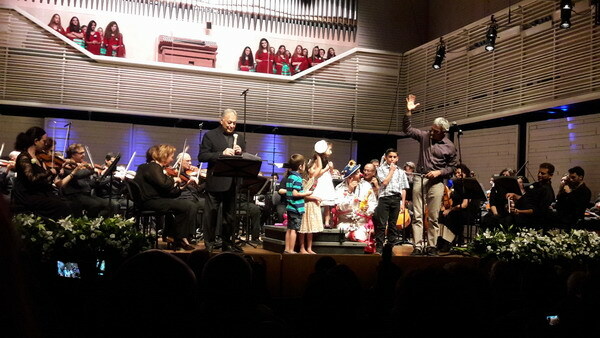 Such was the benefit concert held this week at the Elma Arts Complex in Zichron Yaakov with Maestro Mehta to raise funds for Road to Recovery, the organization that transports very sick children from the West Bank and Gaza to hospitals in Israel for treatment. Like all the organizers and volunteers in the organization, everyone donated their services for the success of the evening, including Mehta, the orchestra, comperes, singers, choir, the Elma Arts Complex hotel and the list goes on." Continue reading Doreen's impressions in her column. Click here to see a video of Zubin Mehta and the organization Road to Recovery. Highly recommended. We're back in Israel after our trip to Moscow and Liepaja, Latvia. On the way back we spent a day in Riga, the capital of Latvia. It was very interesting and we regretted that our stay there was so short. The Segolis have left the Galapagos (more pictures added here) and for the next two weeks or so will be visiting friends in Californias. Mikhal will also be doing some work during this time. While sailing in the Galapagos with her family daughter-in-law Mikhal received the news that she has been awarded an important and prestigious research grant. Congratulations Mikhal! We don't have any more details yet, but Mikhal is obviously pleased with the news and the congratulations from her friends and peers. We left Moscow a few days ago. It was a most interesting visit but too short. Read Doreen's account of the visit. After the visit to Moscow we flew to Liepaja, a town on the Baltic Sea in Latvia. We're here for the European Bridge Pairs Championships. I've been busy with the Bridge competition which is being held in the Olympic Centre. Doreen has made use of the gym here and also visited the city by foot and by bicycle. Click for a few pictures. We will return home in a few days. Being at an event with participants from 30 European countries gives one a different perspective on world events. In Budapest a couple of weeks ago there was Brexit and we experienced the many varied reactions. Unfortunately here in Liepaja we shared the anguish, tension and uncertainty of the French youth and our French friends after the deadly terror attack in Nice. Then came the attempted coup in Turkey with the confusion of our Turkish aquaintances and friends regarding the position and the safety of their families. At the time of writing Istanbul airport is still closed and their getting home is still a potential problem. The Segolis are still in the Galapagos, and enjoying sailing around some islands. Son Aviv Levy and family are back from their enjoyable holiday in Aija Napa in Cyprus. The Segolis are thoroughly enjoying their visit to the Galapagos Islands. 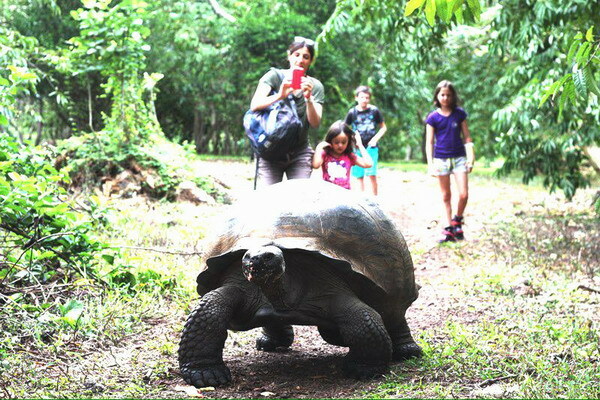 A highlight of any visit to these islands is seeing the giant tortoises that gave the islands their name. There are different sub-species on different islands and the differences between them was a large factor in Darwin's formulating his theory of evolution (together with the variations exhibited by the finches on the scattered islands).. Five of the original 15 sub-species of tortoise are extinct. On our visit to the Galapagos in the 1980's we were fortunate to see "Lonesome George", the last of his sub-species (he died in 2012) and scratch his neck. Touching the tortoises is now forbidden, and Zoe found an alternative (see picture). There are more pictures of the Segolis on the pages of Maayan and Lotem, and Zoe and on the 2016 Events page. We're in Moscow for a few days vacation on our way to Liepaja in Latvia for the European Junior Bridge Championships. Pictures and more on our Moscow trip next week. Son Aviv Levy and family are also overseas on holiday in Aija Napa in Cyprus, and from pictures received they seem to be having a great time. A few days ago we visited long-time friend Dalia Lamdani. We had a very pleasant visit and also discussed the publication of her new book "A Journey through the Pantry." Congratulations to granddaughter Amit Levy on receiving a Certificate of Excellence for Student of the Year in English. We're all very proud of you Amit. 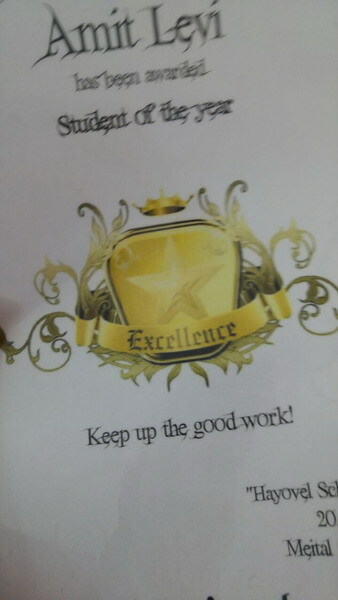 As is written on the Certificate - "Keep up the good work!" We're back from our 2 week stay in Budapest, and preparing for our next trip in a few days time to the European Open Youth Bridge Championships. The Championships will be in Liepaja in Latvia, and we are flying there via Moscow where we'll be for a few days. Son Aviv Levy and family will also be overseas this week on holiday in Aija Napa in Cyprus. Have a greatt time! And also overseas are the Segolis who are in America. They spent a few days in Los Angeles ( where Maayan and Lotem locked horns) and are now in the Galapagos. We received this picture of granddaughter Zoe with a new friend. 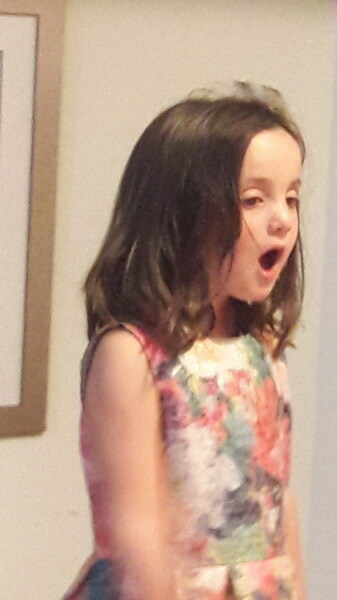 What does a 4 year old do at supper when she is very very tired from all the travelling but doesn't want to sleep because of the delicious french fries waiting for her on her plate. Click for Zoe's solution. Ilai came up to Tel Aviv this week with Dad Aviv for a doctor check-up and enjoyed a meal with Granny Doreen. 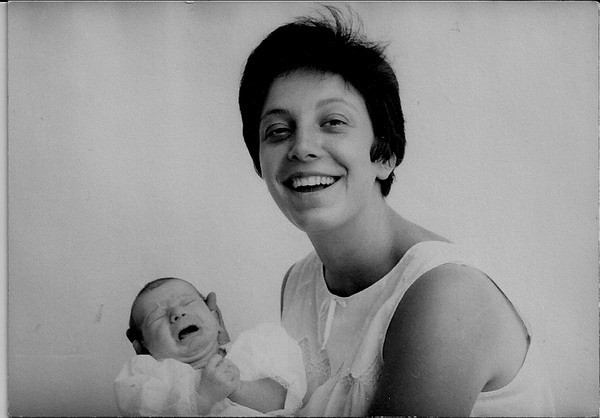 Last week in honour of daughter Vered's 50th birthday I posted a picture of Doreen with baby Vered. They liked the picture so much that they decided to re-enact it, as can be seen here.. Daughter Vered Levy-Ron will celebrate her 50th birthday later this week (on the 28th). Congratulations! Vered has changed a lot since this picture was taken (!) - see for example a picture of her on her wedding day. We could not imagine that she would be accomplished, a loving mother and wife, devoted daughter and friend to all, and a successful businessperson and sportswoman. Who could foresee all that in this crying baby! We are still in Budapest. (see "This Week's News" from last week.). The Championships finished this evening with 2 gold medals for Israel, an outstanding achievement. Two young girls won the Women's Pairs Championships beating 60 pairs from 38 European countries, and at the other end of the age scale the Israel Senior team beat 23 countries to take the gold. The Women's teams also achieved an excellent result - 5th out of 23 countries. The Open team disappointed a little but still came a respectable 13th out of 37 countries. 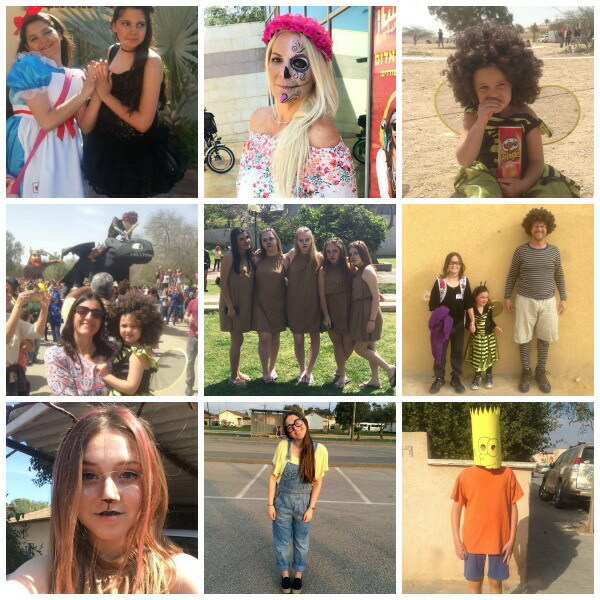 Click for pictures of the winners. It was most interesting being at a European event at the same time as the "Brexit" vote. It was of course the hot topic of conversation and it was very interesting to hear the views of people from so many different European countries, including of course England, Scotland, Wales and Ireland. Doreen utilized the stay in Budapest to visit many places, including some of the many sites of Jewish interest. (see pictures). She also had the stitches (see archives) removed from her cheek and the scar is barely noticeable. By chance Jose and David Keyson were visiting Budapest and staying at the same hotel as us and it was a wonderful and completely unexpected surprise to suddenly see them in the lobby of the hotel. (see picture) Jose is the daughter of our good and long-time Dutch friends Hans and Lottie Reijzer whom we often see (for example), and also a good friend of daughter Vered. 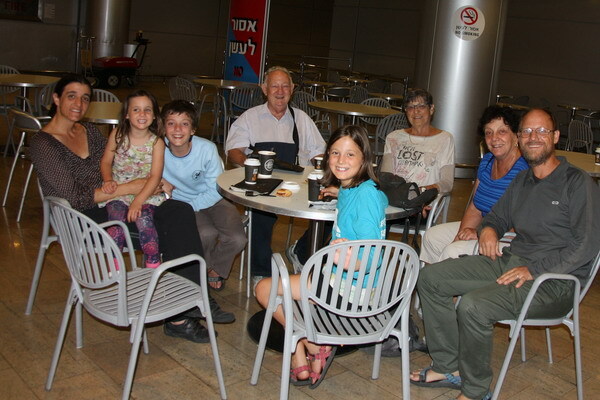 The Segolis, Moran, Mikhal, Maayan, Lotem amd Zoe are on their way to the Galapogos Islands for what I am sure will be a fascinating visit for them. They will also spend some time in California visiting friends from when they studied there. Moran has updated the Segolis site.Click to see in Hebrew and in English. We are proud of our eldest grandson Itamar Levy who received an Outstanding Pupil Certificate at his school's end-of-year ceremony. 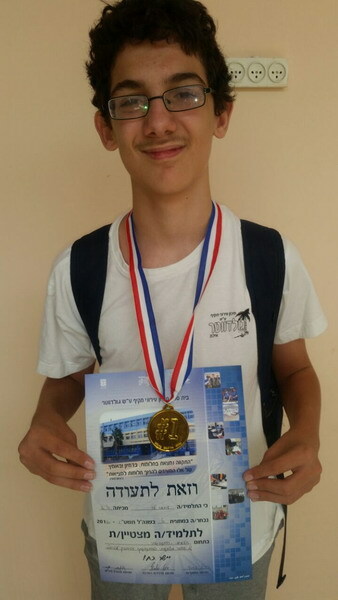 Well done, Itamar, we are proud of you! We wish a speedy recovery to son Aviv Levy who underwent an operation to remove polyps in his nose. He spent a few days in hospital, but is now back home and feeling well. See picture. Also "in the wars" is granddaughter Lotem Segoli who crashed into a wall while trampolining and broke her arm. We hope it's not too painful, Lotem, and wish you a speedy recovery too. We are in Budapest. I am officiating at the 53rd European Bridge Teams Championships and Doreen is keeping me company, seeing the sites and resting. See picture. Today we attended a family celebration of Sarah's 93rd birthday at the home of Eitan and Shuli Haberman. There was a lovely atmosphere there and the food was delicious and varied. Nearly all of Sarah's direct family - children, grandchildren, great grandchildren - were there except for one granddaughter and family who are overseas. Sarah and my mother were 1st cousins, and apart from her direct family, I am her closest relative. (See Goldberg family tree). Our childtren Vered and Moran and their families were also there. Sarah is a Shoah survivor and came to Israel on the ill-fated and controversial Altalena voyage. 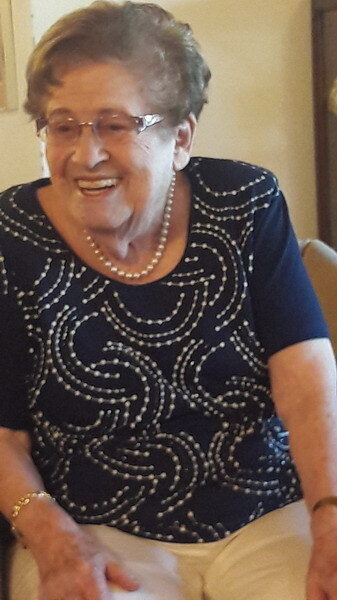 She has appeared on my site many times, for example in explaining a letter written by her sister Shulamit who died in the Shoah, about her 90th birthday, and about meeting our grandson Itamar. 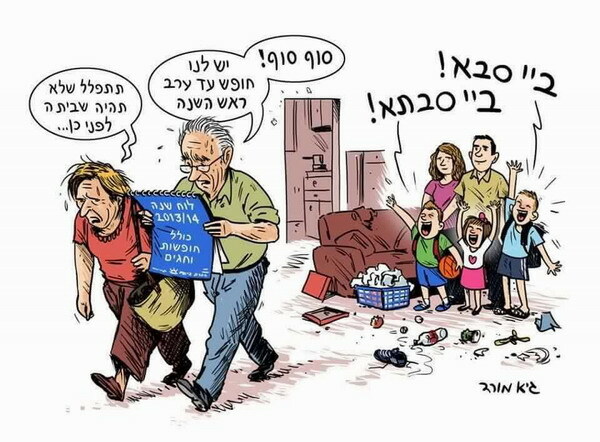 As they say in Israel: Sarah עד מאה ועשרים - ad meah v'esrim - May you live to 120! Lots of love to my wonderful wife Doreen who has her birthday today. We don't celebrate birthdays any more, but we took our granddaughters Danielle and Lior out for dinner last night and wished Granny Happy Birthday. Click for a photo, and also of an old photo of Doreen and son Moran taken many years ago (thanks Aviv for sending it to us!). Son Moran Segoli took part in a play based on some Shakespeare works - Doreen saw it and reports that it was really well performed and Moran was very good in his part. Click for picture. Daughter Vered Levy-Ron has returned from the DRUPA Exhibition in Dusseldorf, Germany. Some more pictures have been added. Click for very impressive youtube video presentations of the Landa Group. I was busy during this week at the 50th Tel Aviv International Bridge Festival. 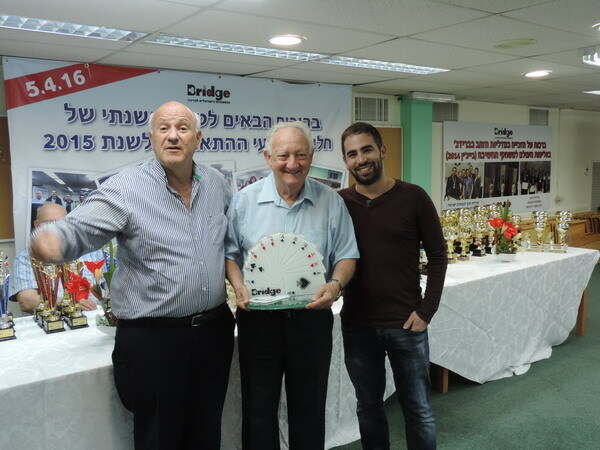 We were honored by the visit of the European Bridge League President, Yve Aubry, and treasurer, Josef Harsanyi. Doreen took them to the Jerusalem Hills to visit the Castel and Flam Wineries. See picture. In a few days Doreen and I fly to Budapest. There I will be officiating at the European Bridge Teams Championships. Next week's update will be from there. Itamar's school trip included a visit to Ben Gurion's Grave at Sde Boqer. Doreen and I were by chance in Sde Boqer baby-sitting and we drove out with granddaughter Zoe to say a brief "hello". Grandson Maayan was having lessons, but a short time after this picture was taken he also arrived (on his bicycle) to see his uncle Aviv and cousin Itamar. The highlight of Itamar's trip was walking up Massada to see the sunrise. Click here for more pictures of his trip. Daughter Vered Levy-Ron is overseas attending the DRUPA Exhibition in Dusseldorf, Germany. DRUPA is the largest printing related exhibition in the world, and the Landa Group exhibited there. Vered is VP for Business Development for Landa Labs, the Landa Group's innovation arm, which explores nanotechnology for use in alternative energy, industrial coatings, cosmetics, packaging, drug delivery and other fields. Click for some pictures of Vered at the setting up of the Landa exhibition. Last Saturday evening Doreen and I took part in a protest march in Tel Aviv against the racist and extreme rightist actions of the present Israel Government. Click here for a picture. It's that time of the year - just before the summer break - when Israeli schools organize school trips for their pupils. Grandson Itamar's trip was to the Negev desert, and included the visit above. 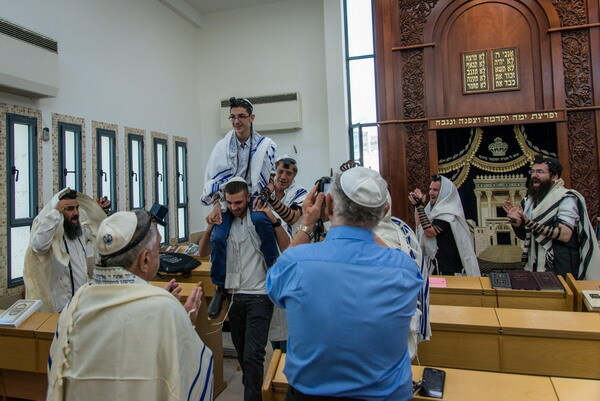 Maayan's trip was connected with his age group's barmitzva year and was mainly to the Jerusalem area. Click for pictures. 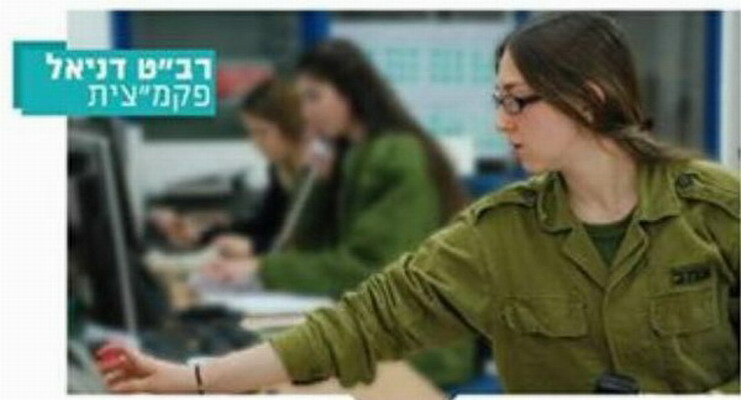 Granddaughter Dani was chosen to be one of the Air Force's representatives accompanying youth visiting Israel on a taglit tour, which aims to get American Jewish youth acquainted with Israel. Pictures here. Doreen has had a cancerous growth removed from her cheek near her nose, and needed 8 stitches. She feels fine, and although swollen, the site seems to be healing well. Doreen is a volunteer for the non-profit "Road to Recovery", an organisation that transports Palestinians needing special medical care from the West Bank Territories to Israel hospitals.You can read about the organisation, which now transports 80-100 patients each day, on their site and see see a CNN featurette about Yuval Roth the founder of the organization. 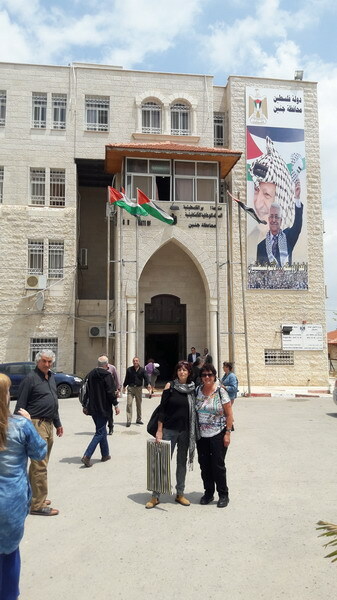 To show appreciation for the work of the volunteers, Ibrahim Ramadan the Governor of the Jenin District (Area A of the West Bank) invited them to visit Jenin. Israelis are not normally allowed to go to Jenin as administration and security are totally under Palestinian control. We were provided with a Palestinian police export and experienced no problems. The governor spoke about the need to make peace; to stop talking about the need and to start doing something about it. Yuval spoke about Road to Recovery as not only filling a humantarian need but also helping pave the way for cooperation beteween our peoples. There was an interesting discussion and a light lunch was served. Read Doreen's impressions in her column. Son Aviv is back from his sailing trip with friends in the Medierranean. See picture. This week we celebrated the holiday of Lag B'Omer. The traditional holiday has lost much of its meaning and is now marked mainly by the lighting, on every available space, of giant bonfires where meat and other food is barbecued. It is our dog Flopsy's favorite holiday as he scrounges around looking for dropped pieces of meat and chicken. The bonfires don't do much good to the environment, and are a fireman's nightmare. At Sde Boqer our grandson Maayan informed us that his class had decided not to make bonfires due to the harm to the environment. When we were younger we used to make a modest fire and use the coals for a barbecue. The kids would wait patiently for "Dad's fireworks" - steel wool heated in the fire and swung around attached to a long wire. This has been continued to great effect by son Aviv. See picture. Grandson Maayan is the latest family member to finish an underwater diving course. The Segolis are in Eilat for the weekend and Maayan made his first dive after the course with Dad Moran. Congratulations, Maayan! Pictures here. This week our son Moran Segoli celebrated 25 years since graduating from the Sde-Boqer Environmental School. About 30 ex-pupils (without spouses) from the class of 1991 gathered at his house and 15 slept over. The celebration was part of the wider celebration of 40 years since the founding of the school, and a few hundred graduates attended and enjoyed the opportunity to meet, get updates and remember past times. We returned from our trip to Italy. (see last week). Although it was only for a week, we managed to visit many places, most of which (despite many many visits to Italy in the past) we visited for the first time. One arrives, one departs. 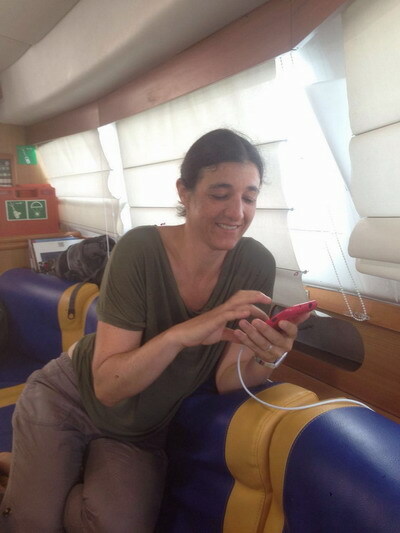 Daughter Vered Ron has returned from her busuness trip to the USA and son Aviv is sailing in the Mediterranean with friends to Greece and the islands. Doreen and I arrived in Rome, Italy three days ago. We hired a car and made our way northwards to Lucignano where I am attending a bridge meeting of the European Bridge League. We are staying at the villa of fellow executive member, Fillipo Palma, who has a winery, and who has royally hosted us. On the way we visited some interesting sites. Click here for some pictures. In two days we return to Rome for a couple of nights and then return to Israel. I had some problem with one of my eyes a few days before leaving for Rome, and had laser treatment which I hope will prove to be of assistance. Daughter Vered Ron is in the USA on a business trip. We have been in Athens for 2+ days and return to Israel late tonight (Saturday). I was here to make arrangements for a Bridge Workshop next January. Unfortunately for us, there is a general transportation strike here - no buses, trams, rail or metro and this somewhat restricted Doreen's plans, but my bridge meetings went very well. Click for some pictures here. Granddaughter Zoe Segoli fell and broke her arm (see picture). Get better quickly Zoe! We were reminded that her big sister Lotem broke her arm just before she was due to fly to South Africa with us a few years ago.But there's no problem with her arm now - click to see a painting she made a few days ago. Daughter Vered Ron leaves for a business trip to USA tomorrow. We'll be in Israel for 3 days and then fly to Italy for a week. This update from Greece - next update from Italy! I'll be at bridge meetings most of the time and Doreen (and I for a few days) will enjoy the Italian countryside. Moshe Kirshner, husband of relative Rochelle (nee Bortenstein, see Schank family tree), had his picture in the press this week accompanied by a long article "The farmer who is smashing the fruit market". Moshe a fruit farmer, and his wife, were disgusted to see that fruit he was selling to wholesalers at ILS 3 a kilogram was being sold in supermarkets at prices ranging from ILS 15 to ILS 40. He offered to sell the fruit (mainly nectarines and peaches) directly to the public for NIS 5-NIS 6 and put his offer on facebook. The response has been overwhelming. Click here for see the picture and read the article in Hebrew. Our Eilat grandchildren Itamar, Amit and Ilai spent the days between the two passover Holy days (chol hamoed) with us in Netanya. They prepared, with Doreen's help, a birthday cake for me on my 76th birthday. Grandchildren Maayan and Lotem sent me a video of them wishing me a happy birthday, and Zoe sent me a drawing she made for my birthday. While the grandchildren were with us during chol hamoed Doreen took them to some places of interest, and today, on their last day, daughter Vered took them to see the "My Selfie and I" exhibition at the Tel Aviv Museum of Art. Zoe's birthday is also during pesach and we celebrated it on the day after the seder. Pictures here. Moran has updated the Segoli site - see it here in Hebrew or in English. I have added some pictures received from son-in-law Aviv Ron to last week's pesach page about the seder and the hikes after the seder. In a few days Doreen and I will fly to Athens where I hope to arrange a workshop for bridge next year. So the next update will be from Athens. Last night we celebrated the first night of pesach - Passover - with a seder at son Moran and Mikhal's house in Sde Boqer. Daughter Vered and Aviv and daughters joined us, but for us it was a relatively small seder, only 11 people. 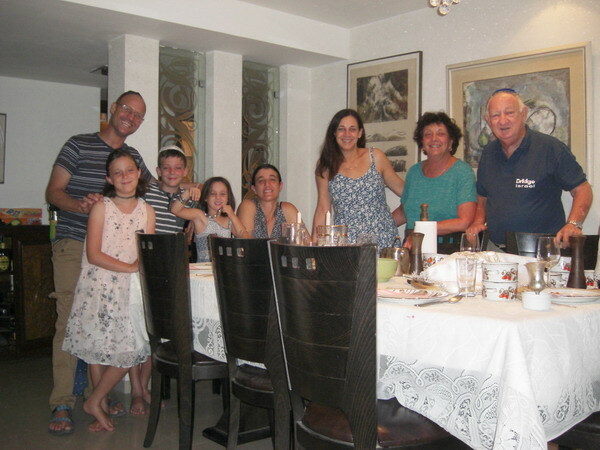 The Eilat Levys had their seder in Eilat with Limor's family. As usual there was enough tradition and more than enough food, and also as usual the highlight was the family rendering of the Ehad Mi Yodea - Who Knows One - song. For some pictures (and a video) click here. While at Sde Boqer some of the family enjoyed a rare swim in a large waterhole in the desert caused by the recent heavy rains. Doreen went to Jerualem to see the exhibition of childhood friend Maureen Fain. See picture. 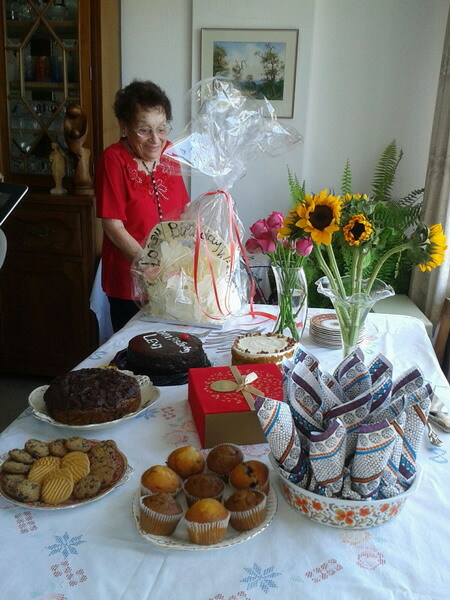 This week, on the 11th April, we celebrated the barmitzvah of our eldest grandson, Itamar. The whole family came to Eilat and we were impressed with how Itamar handled his new "grown man" duties at the synagogue. After the synagogue ceremony we went to Aviv and Limor's home where Itamar's grandmother Margalit had prepared delicious traditional Moroccan pastries. We sang and danced, and then, following the Middle East traditional chinna celebration, had henna smeared on the palms of our hands. This was followed by a lunch for family and close friends at a local restaurant. It was a thoroughly enjoyable occasion. For pictures taken at the synagogue, home and lunch see Itamar's page, and the Family page for some group pictures of the family. An enormous MAZALTOV to daughter Vered and Aviv Ron on their 25th wedding anniversary this week. They celebrated quietly with a romantic dinner. On the way back from Eilat after Itamar's barmitzvah, Moran took Doreen to his project at the Research and Development Station where he works. See picture. This week, at the annual presentation of prizes, the Israel Bridge Federation presented me with an award "in appreciation of your contribution to the development of bridge in Israel and to its position as a power in World Bridge". On my right in the picture is Modi Kenigsberg, who succeeded me as IBF President and with whom I worked closely and productively when he was IBF Chairman; on my left is Gilad Ofir, the dynamic young Chairman of the board of the IBF. Grandson Maayan Segoli came with his school class to an Education conference and fair in Netanya, where his class presented their project of learning. We visited him during his break from explaining and seeing other projects. See picture and description here. This weekend the Segolis went down to Eilat to spend time with their Eilat cousins, and enjoyed a boat ride in the Red Sea. Click for picture. Mina Orenstein, our friend from the Virgin Islands who is spending a holiday with us, celebrated her birthday at a luncheon at our house, where Doreen introduced her to some of our friends. Click for picture. Yesterday Doreen bought a new smartphone and while waiting for it to be updated we had coffee at the shopping mall. Doreen thought she recognised someone at the next table and went up to her, and was greeted with "Doreen!". It was ex-Durbanite Janice Friedberg (nee Sacks). Suddenly the man on the left said "Anthony Levy". I didn't recognise him at first but then realised it was Stephen Berman, a classmate from high school and close friend when we were young. We saw Janice a few years ago (see picture etc) and have had email contact, but Stephen and I had not seen each other for a least 50+ years. It was a wonderful surprise. Stephen and Joyce have come to live in Israel and we will definitely see more of them. Click here for a picture of our Matriculation Class at high school: I am at the extreme right of the back row, and Stephen is second from right (sitting) in the front row. You really realise your grandchild is not a child any longer when the first call-up for compulsory military service arrives. Granddaughter Lior received hers a few days ago. feelings. We are enjoying having old friend from our St Thomas days, Mina Orenstein, stay with us. Doreen and Mina went to Sde Boqer for a couple of days to look after our Segoli grandchildren and Doreen took her to buy wine from grapes grown in Avdat in the negev desert. (see picture.). Today we went to a truly wonderful concert by our favourite baroque group "Barocade" at Abu Ghosh. This week we celebrated the Festival of Purim - the reading of the Scroll of Esther, eating hamentaschen, enjoying an adloyada and of course dressing in costume. <>Grandchildren Maayan and Lotem Segoli helped their dad pick lettuces at the experimental Research and Development farm where he works. Picture here. This week I attended a workshop on a family tree software programme I am thinking of using instead of the present one that I use. One of the advantages of the new programme is the way photos are integrated into the software. 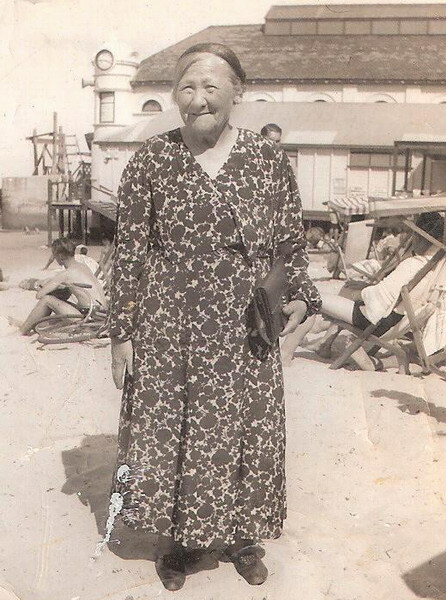 While trying out the programme I looked for pictures of family and came across this picture of my maternal grandmother, Roddeh Shapiro, who died when I was 6 years years old. I have only very vague recollections of her. I remember her as she looked in this photo, which is, as far as I am aware, the only picture that I have of her. I am writing this in Lausanne, Switzerland, waiting for a train to Geneva Airport and a flight back to Israel. I have been here since yesterday, attending a meeing of the Executive Committee of the European Bridge League. Purim, the festival of parades and fancy dress, falls this coming week, and the traditional adloyada (parade) festivites took place today at Midreshet Sde Boqer, where the Segolis live. Click for pictures of Maayan and Zoe at the celebration. Our long-time friend from our Virgin Island days, Mina Orenstein, is visiting Israel. She spent a couple of days with us, and is now with her family for a week or so. She will spend some time with us from next week and we are looking forward to her company. pictures of women performing essential tasks. We were delighted that our granddaughter Daniel Ron was one of the four. Son Aviv and Limor are in Poland on a work organised trip. (Click for some pictures).They return today. 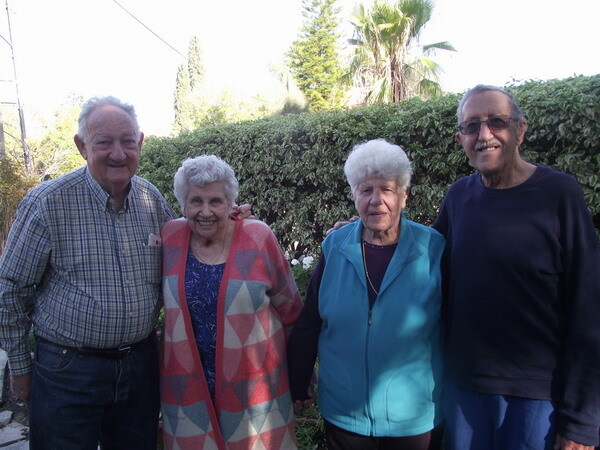 While Aviv and Limor were in Poland, Doreen went to Eilat to look after Itamar, Amit and Ilai. Yesterday I joined her and later today or tomorrow we will return to Netanya. 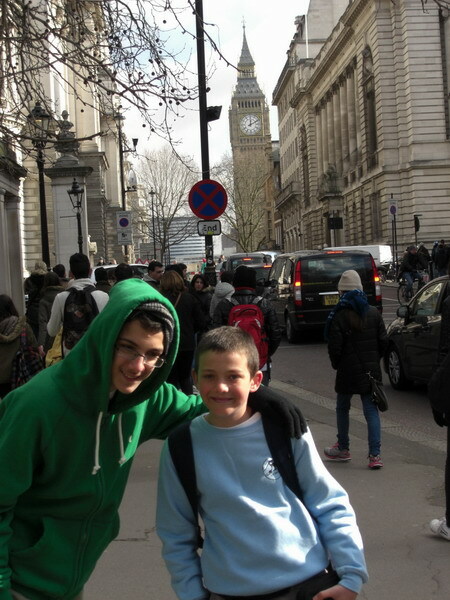 Our last two days in London with our grandsons who will celebrate their barmitzvah this year were full and enjoyable. The highlights were visits to Stonehenge, the Natural History Museum and Madame Tussauds Wax Museum; and buying personalized M&Ms at the M&M Shop. We left on Tuesday and the boys were sorry to say goodbye to London. Click here for a short summary of our visit with some pictures. We are back in Israel from our London trip with our two grandsons Itamar and Maayan. Congratulations to Dave Rothschild on the marriage of his daughter Louise to Sean Barron in South Africa (See picture). From reports on Whatsapp it was a wonderful wedding and family affair. Dave is a long time friend from our youth and is married to Frankie Klaff (see Goldberg family tree). Daughter Vered Levy-Ron is enjoying a skiing trip overseas with a friend. See picture. In a few days time son Aviv Levy and Limor are going to Poland on a work organised trip. Doreen will be in Eilat youth-sitting while they are away. I won't be able to join her as I have some very important bridge meetings that I can't miss. 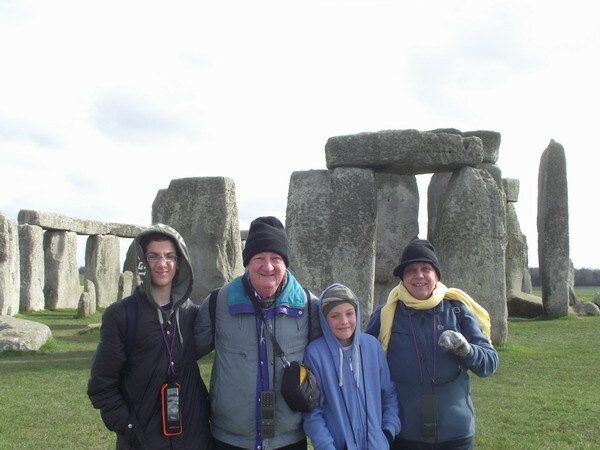 Our two grandsons, Itamar and Maayan will have their barmitzvah this year, and Doreen and I decided on our present to them - a week's vacation in London. We have been here 5 days and have all had a most enjoyable time. Two days to go - enough for the Natural History Museum and Madame Tussaud. Fuller report next week - in the meantime some pictures here. As reported above, we are in London with our grandsons. A few weeks ago I wrote about Doreen's Banana Flambe, and Doreen gave us her recipe. She mentioned that the flambe recipe was also good for guavas, mangoes and peaches, nothing about pineapple. 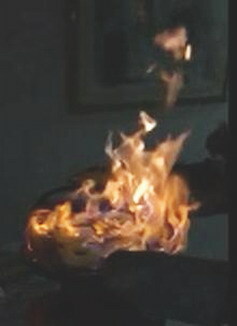 But last night when Vered, Aviv and Lior came for dinner, she prepared Pineapple Flambe (using rum instead of brandy). It was delicious! In response to a request from her cousin Vanessa (Glasser) Tarazza in Johannesburg, Doreen sent her some information about the family. She has slightly changed what she wrote, to make it easier for our grandchildren to understand. You can read it on her column here. Next week we travel for a week to London with our two barmitzvah-age grandsons, Itamar Levy and Maayan Segoli. We are all very excited about the trip. More from London next week! Click for another picture, and for a picture of son Charles, whose birthday is two days later. Doreen found the connections between ancient Rome and the Holy Land fascinating, and has written her thoughts on this. Read her impressions in Jerusalem in Rome. Doreen's views on the group Breaking the Silence elicited some responses from friends, to which she has written her reply. We are in Prague, Czech Republic. 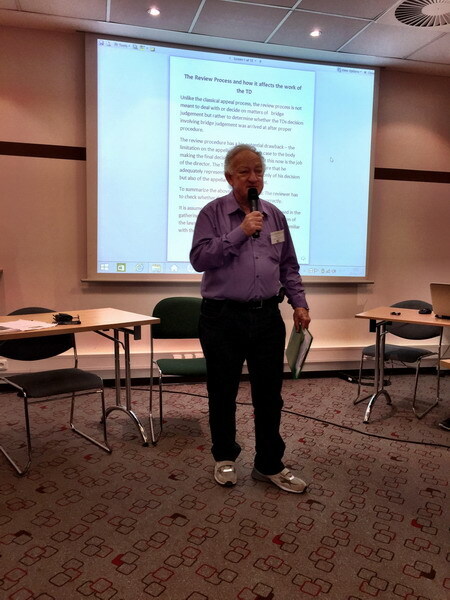 I am organizing a course for bridge International Tournament Directors (judges) in Europe. The course consists of tests, practical exercises and lectures, and the picture above shows me explaining the procedure for reviewing or appealing a decision. As noted above, we are in the Czech Republic. I have been busy with the course, but Doreen has had a chance to visit some of the places missed on our previous visits, and revisit some too. She will write something on this next week. You can read the Segoli family update in Hebrew or in English. We are in Rome, Italy, where I am attending a Seminar of the European Bridge League. 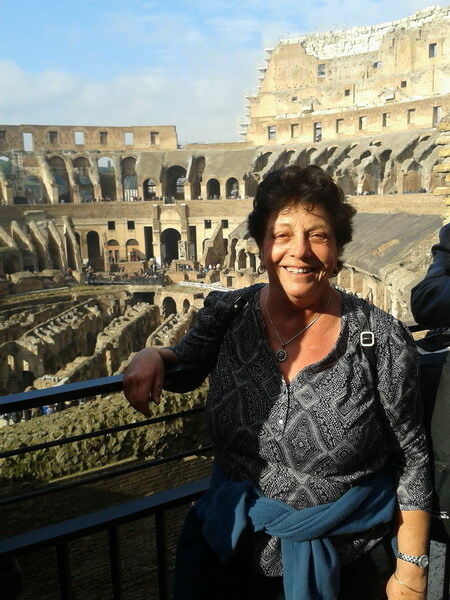 Doreen has used the opportnity to do some siteseeing, including a visit to the Colosseum to fulfil a promise made to grandson Maayan. Last week we went on a tour of parts of Area A of the West Bank territories, arranged by the Breaking the Silence organization. 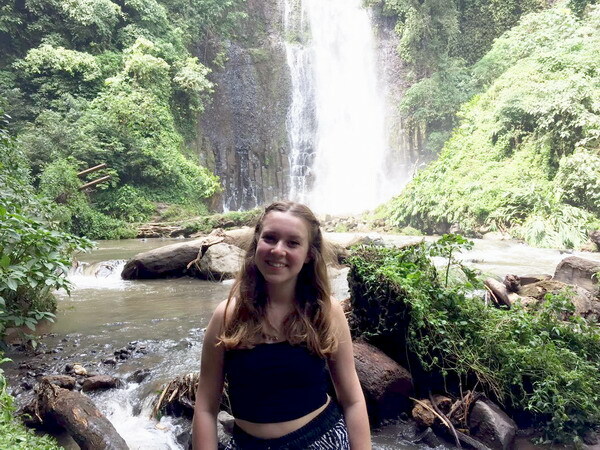 Read Doreen's thoughts about the trip in her column. On Monday we fly to Prague, Czech Republic, where I am organizing a course for international bridge Tournament Directors. Read the Segoli family update in Hebrew or in English. Click for January and February birthdays and anniversaries. Another picture from the "Old Photos" collection. 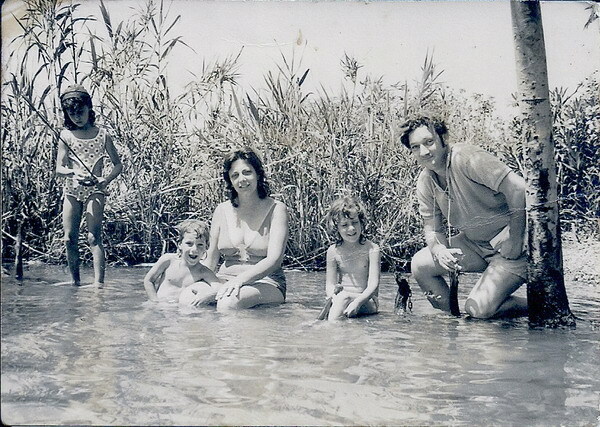 In the 1970's we used to go often to the Kinneret (Sea of Galilee). We would spend a weekend relaxing, swimming and fishing. We usually took our niece Denise and nephew Rael ז"ל with us - especially as Rael so enjoyed fishing. In the picture we can see Denise, Aviv, Doreen, Vered and me - for some reason Rael was not on this trip (and of course Moran was not yet born). Doreen outdid herself by preparing a delicious seafood paella for a most enjoyable dinner with the Gorfils, Colin Kessels and Fines. (See picture). The Segolis spent last night with us, and granddaughters Daniel and Lior joined us for dinner. We are delighted that our teen-aged granddaughters still enjoy visiting their grandparents. The highlight of the meal was Doreen's banana flambe (See picture here), and (Doreen's recipe here). Yesterday we went on a tour of parts of Area A of the West Bank territories, arranged by the Breaking the Silence organization. Although we learnt nothing really new it was a timely reminder of how Israel's occupation of the West Bank leads to the erosion of justice for the Arab inhabitants, and to the deterioration of democracy in Israel and of the values of our youth. Grandson Maayan likes looking through Doreen's cookbook, choosing a menu, and then preparing it. He wanted to bake a pie, and found a recipe in the cookbook for a pie pastry shell. The recipe included the words "bake blind: line shell with aluminium paper..... and bake in a hot oven". I didn't know this but "bake blind" refers to baking a pastry that is empty and will be filled later. 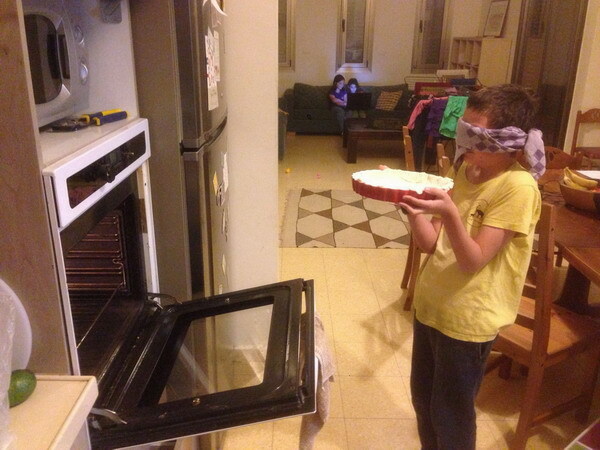 Maayan has a lovely sense of humour and the above picture is Maayan's interpretation of "bake blind" ! I received news this week of the passing at the age of 93 of Morris Galp. (see Matz family tree). We extend our condolences to his wife Avril and family. Avril drew my attention to Morris's participation in the "Overland Safari from South Africa" in 1946. The British had imposed conditions on the rights of Jews to enter Palestine, and a path-finding group of eight set out - ostensibly on safari - to find a route across Africa to reach Palestine. Of the eight who set out, Morris was the only one to succeed. It took him a year and and an account of his fascinating journey can be read here. Our friend Yona Wiseman came for the weekend and we enjoyed a dinner with her and some mutual friends. See picture. 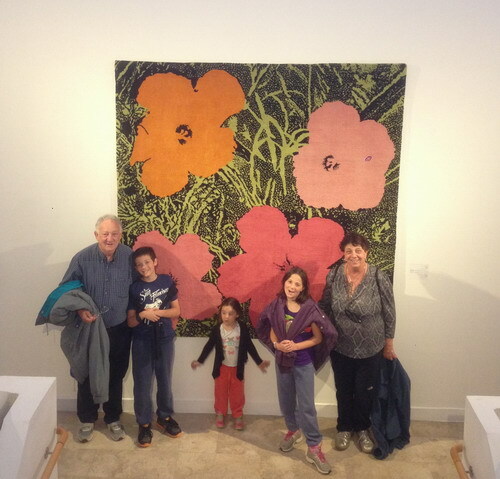 Today we joined the Segolis, son Moran and grandchildren Maayan, Zoe and Lotem, for a visit to the Haifa Museum of Art to see an exhibition "From Andy Warhol to the present day". Although not quite my "cup of tea" the exhibition of pop art was interesting and enjoyable. Earlier in the week we visited granddaughter Danielle on the army base where she is doing her army service. We were impressed by the responsible job she has and at how well she is doing it. Not much else this week - the highlight being a reasonably enjoyable opera (Il Trovatore) sung very well. We wish all our frelatives and friends a Happy New Year and a 2016 of happiness and success. Just over two years ago Doreen and I visited the Gorongosa Nature Reserve in Mocambique. This reserve, once one of the richest in wild life in Africa, was devastated during the civil war in Mozambique. There is now a huge Restoration Project to rehabilitate the reserve. While we were there we were fortunate to see and meet scientists aiding the project, and to witness a National Georaphic crew photographing there. Last week we were thrilled when the result of that filming, a 6 part series on Gorongosa, Africa's Wild Kingdom Reborn, aired on the National Geographic Channel and we recognized many scenes that we had seen unedited on computer screens. One of the "heroes" of the series, the lion MO2, was our picture of the week in Ocober 2013, and you can read about Gorongosa and our trip there by clicking here. Doreen entertained some of her friends at a luncheon at our house this week. See picture here.